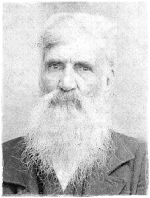 Jesse Ritter, Sr. was the progenitor of the Moore County, NC Ritter family and is the earliest known ancestor to many of the Ritters throughout the south. Jesse Ritter, Sr. was born around 1735 and he can be found in numerous court records in Cumberland/Moore County, NC beginning in 1769 up until his estate was settled in c1810. Recent discoveries from Linda Ritter of Louisiana detail the Ritter family history through personal letters as well as an oral family history written in 1910 by Murry Connie Ritter as told by his father William Young Ritter who passed the oral history down from his grandfather, Everett Ritter, Sr. The oral history and letters richly detail the beginning of the Ritter family in America through the migration of John Heinrich Ritter and two brothers from Germany to Pennsylvania in the late 1600's. In 1734, Henry Ritter married Sarah MNU in Virginia. His parents disapproved as she was not German. Jesse Ritter Sr. was born to them in 1735 and Sarah died during childbirth or shortly thereafter. After Sarah's death, Henry Ritter relocated to Salisbury, NC near his brother and remarried a cousin of his mother, Augusta "Gussie" Hobson Holt in 1736. She was also recently widowed. Henry and Gussie had several children but only John Ritter was named. According to the oral history, Jesse Ritter and his half-brother John left the Salisbury, NC area and settled in Moore County, NC near their uncle Moses Ritter. Jesse reportedly married Susannah/Hanna/Anna Wallace and had Everett, John, Hannah, August [died young], Thomas, Cloey, Elizabeth, James [never married], Jesse, Nancy and Susan. Jesse's wife Susannah apparently left him and he remarried Charlotte and had Hannah and Daniel. Susannah returned and "ran off" Charlotte and the kids and they left for South Carolina. After Jesse Ritter died, his oldest son Everett migrated to Tennessee, Alabama and Mississippi. These letters as well as other heirlooms went with Everett and were passed down through multiple generations. Jesse originally owned land one mile north of Bensalem Church off of Alton Road. He sold this land to Nathan Smith in 1774 and moved east near Buffalo Creek eventually settling off of Richland Creek. A majority of the land he owned was located in the area around Calvary Baptist Church continuing south towards Bethlehem Baptist Church. He also owned land over in Montgomery County, NC during the early 1780's. It is unknown whether he actually resided in Montgomery County at the time or was merely speculating land. In early Moore County, NC records, Jesse Ritter was often found with the Smith, Newton, Cagle, and Maness families. His children married into the Richardson, Seawell/Sowell, Bean, Smith and Muse families that were neighbors in and around his property on Richland Creek. Sons Everett [c1760-aft 1850] and Jesse, Jr. [1770/1780 - 1838] migrated to west to TN, AL, MS, and MO, AR respectively and many descendants throughout the south can trace their lineage back to one of these men. Several male Ritters descending from Jesse Ritter very close match the Y-DNA of male Wallace descendants of Everet Wallace [c1770-c1845]. There is no known direct relationship between Everet Wallace and Jesse Ritter but the DNA results clearly show a close one. It is very likely that either Everet Wallace's father or grandfather was a Ritter or that Jesse Ritter, Sr.'s father or grandfather was a Wallace. The new information suggesting that Jesse Ritter's wife was Susannah Wallace further complicates the puzzle. An interesting piece of circumstantial evidence is that Jesse Ritter, Sr. had a son named Everett Ritter [c1760-aft1850] and that the names Everet and Isham are found consistently through the generations of both families. DNA from Jesse Ritter's descendants also is a relative match to a descendant of James Ritter [~1764-1816] of Surry County, NC. It is a believed that James was the son of Moses Ritter and Hannah Bradbury/Bradberry of Wayne County, NC/New Hanover County, NC. There are several references to a Jesse Ritter and other Ritters in Dobbs County, NC and Eastern NC colonial records. Dobbs County was carved from Johnston County and was later split into Lenoir, Wayne, and Greene counties and the actual deeds were lost in a Lenoir County courthouse fire. It is very likely that these Ritters are related to the Moore County, NC family and these references may very well be of Jesse Ritter, Sr. prior to his migration to Moore County, NC. Combing the records with the oral history could possibly indicate that Jesse and half-brother John migrated first to Dobbs County, NC and then to Moore County, NC at a later date. Moses Retter received a 170 acre Land Grant located on Buck Swamp and the Mouth of Clayey Branch adjoining his own line and William Grant. David Shurley received a 150 acre Land Grant located North of the Nuce [Neuse] River, East of lower Falling Creek and West of Clarks Bank adjoining Jesse Retter, Stanley, and Shurley's own line [formerly Clarks]. Moses Retter received a 300 acre Land Grant located between Mirtle Branch and Buck Branch adjoining James Bradberry, Henerey Easterling and near Retter's own line. John Donahoe deeded Nicholas Newton 200 acres located on Wet Creek. Samuel Williams, Jesse Riter and Thomas Keys were witnesses. Jesse Rutter received a 200 acre Land Grant located on Wet Creek adjoining Jas. Chaney and Nicholas Newton. James Stevens received a 100 acre Land Grant located on Horse Creek adjoining Lewis Sowell. Jesse Ritter and Robert Edwards were chain carriers. Jesse Ritter deeded Nathan Smith 200 acres located on Wet Creek adjoining James Chainey and Nicholas Newton. Thos. Branford and William Manes were witnesses. Jesse Ritter received a 156 acre Land Grant on Dencen's Fork of Little River adjoining William Haltom. Spencer Alton and Robert Stephens were chain carriers. Jesse Ritter received a 100 acre Land Grant located on Buffalo Creek adjoining his own improvement and Matthew Ledbetter. John Ritter and Thos. Ritter, Junr. were chain carriers. Jesse Ritter received a 50 acre Land Grant located on Richland Creek adjoining Campbell. William Manes and Thos. Ritter were chain carriers. John Ritter and Elizabeth Richardson were granted a marriage license. Jesse Ritter was the surety. Numerous descendants of Everet Wallace [c1770-c1845] and Jesse Ritter [c1735-c1810] have been tested at the 37, 67 and 111 marker levels and have shown to be an exact match to each other. Everet Wallace was the progenitor of the Wallaces of Moore County and has proven to be the roadblock for Wallace researchers for the last thirty years. He has been well documented in Moore County, NC from the 1790 Census up until his death around 1845. Several possible theories and leads have come and gone over the years but none have successfully been proven. The same can be said for Jesse Ritter, Sr. among the Ritter family researchers. He can be found in Cumberland County, NC [present day Moore County] as early as 1769 and consistently through his death around 1807/1808. There is no known direct relationship between Everet Wallace and the Jesse Ritter but the DNA results clearly show a close one. According to FamilyTreeDNA, an exact match at the 67 marker level indicates there is a 68% chance that the Wallaces and Ritter share a Most Recent Common Ancestor within 5 generations. Those probabilities greatly increase each additional generation to 82% chance within 6 generations, 90% within 7 generations, 94% within 8 generations and 97% within 9 generations. It is very likely that further back either Everet Wallace's father or grandfather was a Ritter or that Jesse Ritter, Sr.'s father or grandfather was a Wallace. New information suggesting that Jesse Ritter's wife was Susannah Wallace further complicates the puzzle. An interesting piece of circumstantial evidence is that Jesse Ritter, Sr. had a son named Everett Ritter [c1760-aft1850]. We have recently upgraded several tests to the 111 marker level to further narrow down the generations between the common male ancestor.